The choice is very simple if you’re looking to get your company funded-go for the private limited (Pvt Ltd) structure. By and large, investors and venture capitalists prefer to fund private limited companies. The other two company types- Limited Liability Partnership (LLP) and One Person Company (OPC)-work best for anyone who is looking to run their business without external funding and wish to have effective control over all the operations of the business. Let’s understand the nuances of each legal structure to help you choose the right one for your company. To begin with, let’s have a quick overview. Now let’s take a look at each legal structure in more detail. The private limited legal structure is most commonly used for the incorporation of a company. It is preferred because this structure keeps the liability of the members limited to their share in the capital. A private limited company is ideal for anyone who is looking to raise capital from external sources and/or give ESOPs to employees. A private limited company has to be registered with the Registrar of Companies (ROC). Upon completion of the registration process, a Certificate of Incorporation (COI) is issued. The Ministry of Corporate Affairs (MCA) has introduced a fast-track registration process that enables company registration via a single form. The registration process is done online and all documents are required to be submitted in electronic format. Registering for a private limited company means the company becomes regulatory-compliant. This makes the company attractive to venture capitalists and private equity funds. Even bank loans are easier to get for private limited companies. From the perspective of the directors in a private limited company, their personal property would not be used to repay the company’s debt. 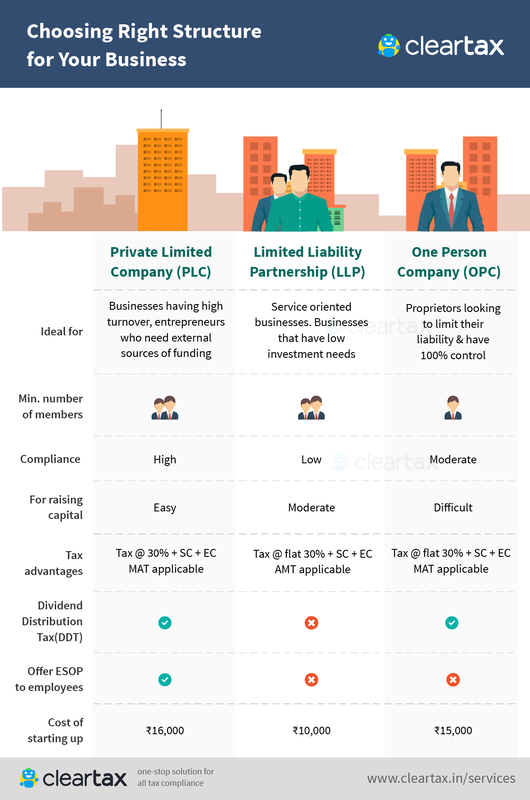 Convinced about registering for a private limited company? Get started right away. Anyone running a business with partners can go for the LLP registration. An LLP works best for startups and small businesses that are run by partners and want to have the nominal regulatory compliance. A limited liability partnership allows the partners to be protected from any negative issues that arise because of the other partners. An LLP limits the liability of the partners to as much is their contribution to the company. An LLP incorporation is also cheaper and easier to get. An LLP is usually a smart choice for freelancers who wish to give their bootstrapping business a proper company structure from a legal perspective. An LLP will work as long as the partners don’t require external funding and when they do, the LLP can be quickly turned into a private limited company. Click here if you feel that an LLP structure is right for you. An OPC is ideal for anyone who runs a business by his or her own self, wishes to have effective control over all operations of the business and work in a corporate framework. Any entrepreneur who wants to form the company with limited liability should register for OPC. An OPC can be registered with a minimum capital of just Rs 1 lakh. But if the paid-up capital exceeds Rs 50 lakh, then the OPC has to be converted to a private limited company. The same holds true when the OPC’s average turnover for 3 consecutive years exceeds Rs 2 crore. As is the case with registering a private limited company, OPC registration has also been made an online process by the Ministry of Corporate Affairs. If OPC fits your needs best, get the registration process started. If you’re still not sure about which legal structure to choose, go for our Startup Plan and seek expert advice.